I’m probably better at ceratopsian taxonomy than a lot of people (largely thanks to my five-year-old son’s interest). I wish there were more uses for this in everyday life. Book critics. Oh, wait, that’s not quite what you meant, is it? Editors? Michael Redhill, since he’s in Toronto and I see him only rarely. Danny Katz – five minutes on a bus with him in Perth two years ago reminded me how funny he is. Would I invite five all-time literary legends I’ve never met? No, because I’d be far too anxious in their presence to have fun. I might make an exception for Dorothy Parker, since she’d fit in well with Redhill and Katz, I think. And another exception for William Shakespeare, just to see who actually turned up. Would it be an actual William Shakespeare? Would he look like the two existing portraits that are supposedly of him? Or would the Earl of Oxford turn up instead? If I’m inviting Shakespeare, I should invite one other writer from his time to make it easier for him. Christopher Marlowe. He’d be interesting. That’s a very male list. Maybe I should bump one of them for someone like Tara Moss, who can hold her own in any company. While a time machine might be far too dangerous, I’d like a version of it that would let me go back a short time to correct any obvious mistakes. Even five minutes would let me sort out a lot of them. Five words? I’m a novelist. I can’t do anything in five words. Okay: ‘sitting, staring, sometimes typing something’. Anything more than ‘Nick who?’ will do. My laptop, a printer, a printed copy of the most brilliant book ever written and two backups on USB sticks. That’s my ideal. I’m picturing it now: I’ve just completed the work of (unexpected) genius, saved it in a range of formats and stepped away, finally accepting that I was wrong during all those years of self-doubt. Okay, don’t sue me for product placement, but the only book within reach happens to be New Boy. Page 22 begins with an exclaimed name (one word), followed by ‘Ms Vo sounds tough all of a sudden.’ I think that gives me ‘Vo’, which is no pushover. Hmmm. It’s for Daniel Defoe. If Robinson Crusoe took all his clothes off before swimming to the shipwreck, how did he fill his pockets with biscuits? What? Next you’ll tell me you’re taking my TV away and then sucking all the oxygen from the room. Okay, if I have to choose, I’d hold out for reading. Reading is why I write in the first place. Assuming you’ll line up some income stream for me, I’ll give up writing for reading. Though you do realise that stories might take shape in my head from time to time anyway, don’t you, even if I’m not allowed to write them down? Nick Earls is a popular Australian novelist who writes for both children and adults. 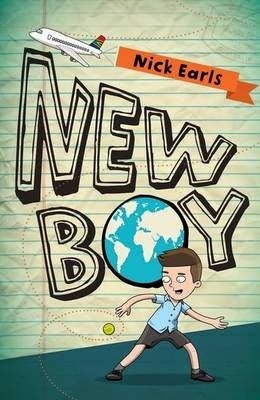 His books for younger readers include the junior fiction Word Hunters series and his latest release, New Boy, published by Penguin. Visit Nick's website and Facebook page for more information about his books and latest author events.